DNVM Series of Digital Night Vision Scopes from ATN offer unparalleled capability with a low cost solution. 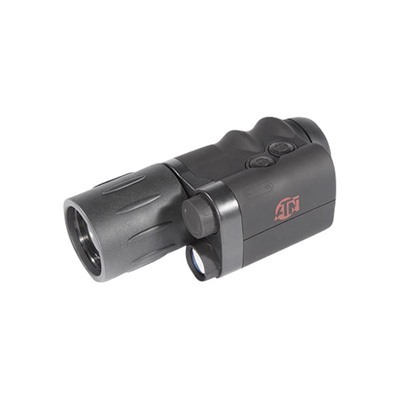 Highly sensitive senor provides exceptionally bright and sharp image, allowing the scope to work effectively even in extremely dark conditions. The key to the overall performance and quality of the image is the Vivid Color Display that improves contrast, depth perception, and overall image quality. SPECS: Magnification – 4x Lens Diameter – 4x: 70mm. Focus Range – 5 yards to infinity. Eye relief – 10mm. Diopter Adjustment - +-1.5. Power Supply – 3V CR123A. Operating Time – 8+ hours. Operational – Day or Night. Display – Vivid Color Display. Operating Temperature - -22oF to +140o F. Dimensions – 7.2” (L) x 3” (W) x 2.5” (H). Weight - 4x: 12oz, 6x: 13oz.